MID GmbH: "Achieving Sustainable Requirements Engineering" is the motto for the 12th requirements engineering conference, REConf, March 11-14 in Munich. MID will be there as sponsor, exhibitor and will give a talk about business requirements archeology as a basis for model-based requirements engineering. You can find more information about REConf 2013 here: www.reconf.de. You can find more information about requirements engineering with Innovator under www.mid.de. Almost all software development projects need to take existing systems into consideration. Requirements archeology takes a closer look at legacy systems, regardless of whether they need to be replaced or improved. MID consultants Kirsten Leonhardt and Ralf Nagel show how requirements can be documented based on modeling to attain an effective basis for replacing, further developing or maintaining an existing system in their talk "The Quest for the Lost Requirement - Business Requirements Archeology as a Basis for Model-Based Requirements Engineering", Tuesday, March 12, 2013, 12:25 to 1:10 p.m. MID will showcase the new options available for requirements management with Innovator at the exhibition. Requirements and use cases can be created using Microsoft Word and linked and synchronized with the Innovator model. Innovator leaves it up to the user to decide how they want to create their requirements: whether that be as text, model, process, use case or mask flow. Requirements can be created and managed as both lists or forms. Textual requirements can now be created in Microsoft Word and Excel using Innovator Office Integration without Innovator even needing to be installed on the user's system. You can synchronize Excel or Word with the central Innovator model at the touch of a button. You can find more information about REConf 2013 here: www.reconf.de. 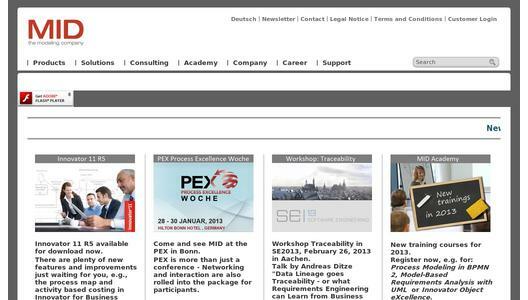 You can find more information about requirements engineering with Innovator under www.mid.de. MID teams are focused on central modeling as a reference for extensive processes in companies and big IT projects. Top German companies and authorities rely on the products, knowledge and support provided by MID - the modeling company. 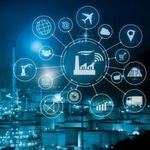 More than 100 specialists put this vision of realizing efficient and effective IT systems with concrete requirements for processes and products into practice. And all this, for more than 30 years. Processes and requirements can be created in the standard notations BPMN 2 or UML 2 and can be seamlessly transferred into UML or ERM software models. The aim is to develop or generate executable code. A perfected rights and roles concept for all stakeholders, transparent collaboration and powerful functions ensure your model success. 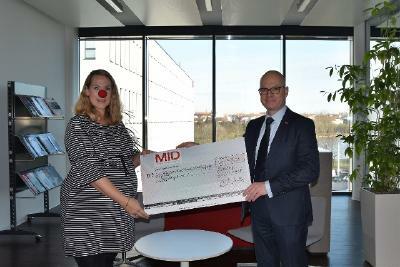 MID spendet an Klinikclowns Nürnberg - Clownprojekt e.V.